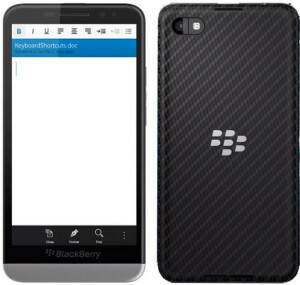 The Blackberry is yet again to unveil the latest of its BB10 OS powered smartphone named Z30. It is the 4th smartphone of the BB10 Os lineup. The BB10 OS isn’t been really the pick for users due to its lack of quality apps and high prices. The Z30 smartphone is almost similar to Z10 apart from having a larger screen glass and SnapDragon S4 Pro processor. The new model is the same as the Z10 and features no hardware buttons at the front. It has got a sophisticated 5 inch 720p display, a 2 MP HD secondary camera and a notification LED at the apex. It is loaded with a Super AMOLED panel display. Under the hood, it is equipped with a 1.7 GHz Qualcomm SnapDragon S4 Pro variety. The phone also features a 2 GB of RAM, Adreno 320 GPU and 16 GB of storage which can be expanded. Z30 is loaded with an 8 MP main camera with LED Flash and 1080p Full HD video option. Bluetooth 4.0, microUSB 2.0, NFC, dual-band Wi-Fi and LTE can be handy for connectivity in this Smartphone. A few changes have been made this time to distinguish it from the earlier version. This time, it has OS version 10.2. It is also features with BB Priority Hub which is BlackBerry’s take on Gmail’s Priority Inbox. Now you can sent the BB10 messages without having to shut the current running app. Received messages can be grabbed directly from the lockscreen. The phone is loaded with a powerful 2880 mAh battery for long lasting usage. The new Z30 is expected to be unleashed in the coming couple of weeks while the price of the phone is also not confirmed yet.